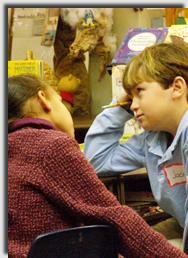 Students ask questions and seek answers to deepen their understanding before, during and after reading. By bringing their own questions to small groups, students determine what they don't know and get help in comprehending. Students classify questions to help them learn to ask better questions. I can ask questions about vocabulary. I can ask questions when I’m confused. I can ask questions that will spur good discussion about main ideas, theme, and author’s purpose. I can recognize and discuss literary elements as a part of author’s purpose. I can ask questions that will help me understand what effect the reading has on me. I can prepare for discussion by reading and recording my questions that didn’t get answered. I can participate in a discussion effectively. Get started: Who asks the questions in your classroom? "Teachers dominate 76% of classroom talk...60% of teacher talk is questions... the number of questions asked by the teacher in the study was almost 100 per hour (Kathleen Mohr, Reading Teacher, Feb. 2007)." Sadly, most questions were worded in such a way that students were to guess the response the teacher was looking for. I saw myself in those numbers. What made me change was my teacher research. As a result of working with Dixie Goswami through UNC Charlotte, I now select one inquiry to study in depth each year; MY teacher-research project keeps teaching fresh and meaningful. One year I studied questions. I taught students how to ask questions about what they read. I showed them how to ask questions by explaining my thought process with texts that were difficult for me to read. I expected that students, too, would bring questions to reading groups. I gave them time in class to read and prepare what they could say or ask by writing it in personal reader-response daybooks. There, in the safety of a small group, we admitted what we didn't know and sought help from one another. We struggled at first because students had been conditioned by school to believe that if they read the text, they shouldn't have any questions. Therefore, they often did not bring questions. So, if students claimed to have read but didn't have questions, I was prepared to ask mine. Also, some students truly don’t have plot questions, so I taught them how to ask questions about main idea, theme, author’s purpose and literary elements. At the end of the year, I interviewed dozens of students. I asked them whether they comprehended texts better when teachers asked comprehension questions or when they got the chance to ask their own questions. My most able students told me that asking their own questions helped them look at deeper levels of meaning than they ever had before. One girl said, "I used to just put the book down and read another. I didn't know you could talk about books with other people." Of course, I'm generalizing here, but most of my average students thanked me for letting them ask questions. They told me that before this year they could answer the teachers' questions, usually getting As or Bs on quizzes, but they left the book not knowing the answers to their own questions. And finally, my biggest strugglers said they liked when the teachers asked the questions. I'm guessing, but I think that's because it's uncomfortable to come to reading group prepared with questions, especially if one's understanding of text is limited and asking questions reveals what one doesn't know. Or, sometimes comprehension was so faulty, they didn't know what to ask. Changing from a question-asking teacher to a let-them-ask-the question teacher is the hardest change to make for those creating a proficient-reader classroom. Maybe that's because we feel we have to test comprehension of a text instead of how a reader comprehended. Maybe it's because we haven't read all the books ourselves and we feel the students might fool us. Maybe we worry they might spend time on "thin" questions or won't prepare for book discussion groups at all. For a checklist of lessons to teach to allay your fears and assure your success, download my Question Study Checklist on this page and jump in! Students have to use (and make sense of) literal details in order to discuss deeper questions. When asking their own questions, they practice literal and inferential thinking. By watching teachers model, students learn how to ask questions. Getting answers to their questions improves their comprehension. Students ask questions about things I never imagined would need to be discussed! Without clearing up these misconceptions, comprehension is compromised. By handing over the work of making sense of the text to students, teachers can put quiz-making and taking time to better use. Any student, regardless of reading level, benefits from asking questions about confusing parts or author’s technique. Grade how students read to assess whether reading skills are improving. Funny questions to set a culture that values asking questions. Introduce students to using questions by demonstrating with your Think Aloud and then releasing responsibility with a Think Along. My tips for teaching students what questions to ask. Poster thats explain what students can ask if they’re stuck. Includes Bloom’s and Marzano’s questions for students to study. Passages are included in these minilessons so that students can practice asking different kinds of questions as outlined in Mosaic of Thought by Keene & Zimmermann. Look at question types by Keene & Zimmerman, Bloom, Marzano, and test stems that you or students might ask about books. Students stop at preplanned points to monitor their comprehension and talk as a group throughout the reading of the text – not just at the end – with this lesson format. Asking comprehension questions following reading has limited value in helping teachers learn about children's understanding or in developing children's ability to comprehend.